Los Angeles is the most congested city in the world, according to the transportation analytics firm Inrix. Drivers in the city spent an average of 104 hours stuck in traffic during rush-hour periods in a year. In second place was Moscow with 91 hours, followed by New York with 89 hours. Other cities joining the list of the world’s top 10 most congested cities are San Francisco, Bogota, Sao Paulo, London, Atlanta, Paris, and Miami. US cities make up half of the list. Bob Pishue, Inrix’s senior economist, said that the increased traffic in 2016 was attributed to the country’s stable economy, continued urbanization of major cities, employment growth, and low gas prices. For this particular study, INRIX used a new methodology which “calculates the percentage of time that drivers spent in congestion at different periods of the day/week and on different parts of a city’s road network.” It analyzed congestion in 1,064 cities in 38 countries, which is considered to be the largest study ever of its kind. Meanwhile, other U.S. cities that made the world’s top 20 list for congested cities include Washington D.C. (13th place), Dallas (14th place), Boston (16th place), Chicago (17th place), and Seattle (20th place). In 2016, U.S. drivers spent an average of an hour a week stuck in traffic on their commutes. U.S. drivers spent nearly $300 billion in wasted fuel and productivity, which is tantamount to around $1,400 per driver. In Los Angeles, the average driver experienced a loss of $2,048. The slowest traffic across all congested periods in 2016 was in Oaxaca, Mexico. Louisville and Lexington ranked 294th and 504th in the Global Traffic Scorecard. Louisville drivers spent 23 hours last year in congestion while Lexington drivers consumed 15 hours. But when will traffic congestion be better? 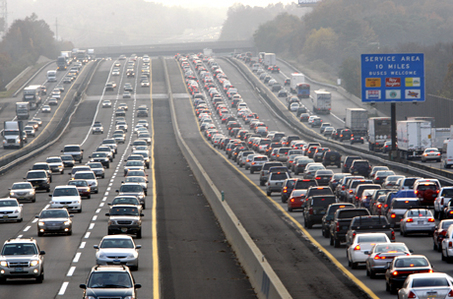 As a Kentucky Accident Attorney, I must say that traffic congestion has already become a part of our daily lives. It’s not a new problem, but it remains unresolved. I hope that our government will be able to finally address this issue with the appropriate infrastructure programs and better monitoring of traffic improvement projects. The consequences of traffic congestion are adverse and when these get worse, we may see more people getting injured and killed due to road rage. Let us hope that more projects will be created to ultimately improve traffic flow and make our roads safer.